Paka was so eager to join John and Ashley on the Lomami River that he sent his father, Nobirabo, to talk to me when I was in the Ituri Forest at Epulu (Okapi Faunal Reserve) earlier this month. I’ve known Nobirabo for more than 25 years. I taught him English when he was a young primary school teacher and John and I were doing our PhD research in the Ituri. 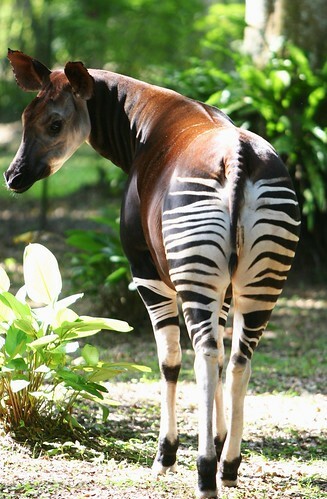 Later, Nobirabo joined our project to study Okapi in the wild. “Epulu is a long way from Kisangani,” I warned. 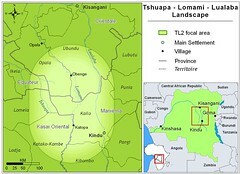 The expedition is already making preparations in Kisangani, from there Ashley and John will launch south. 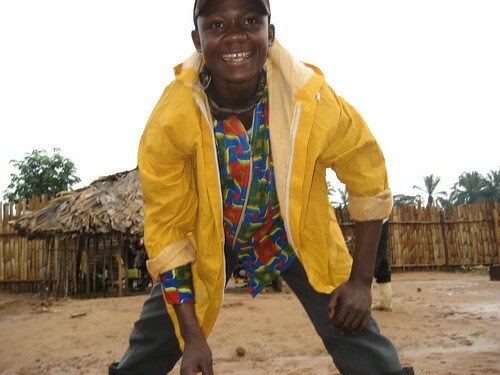 But Paka had another reason for wanting to join; he could save money for going to university. 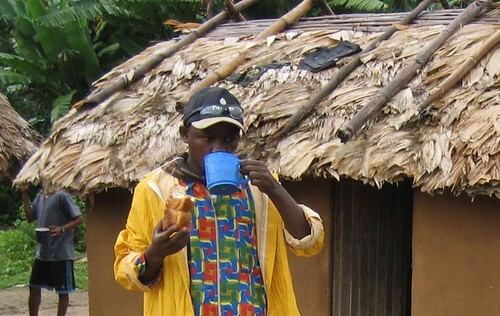 Paka taking his morning tea before heading for Kisangani on his one-gear bicycle. No Problem. 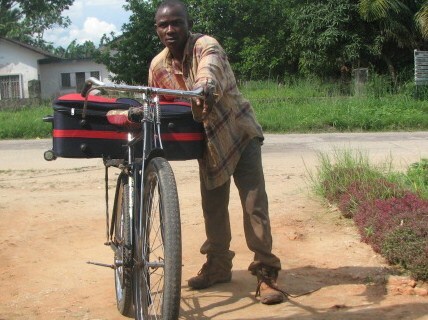 Paka set out with a one gear Chinese-made bicycle . It is the same model that young men modify into cargo transport-carriers to replace trucks. The road is still in too impossibly poor condition for truck traffic. 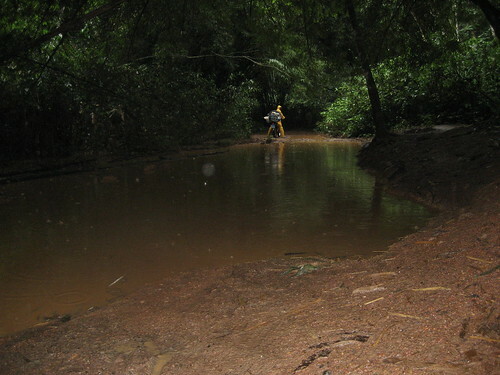 Bicycle transporters, “Toleka”, pushing their cargo up the slippery first section of road past Epulu. The Chinese have broadened and leveled but not yet surfaced. 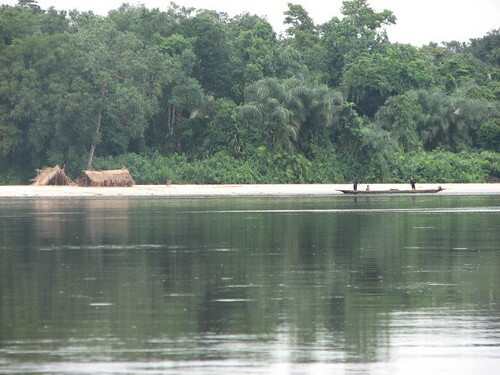 From Epulu to Kisangani is 460 km. 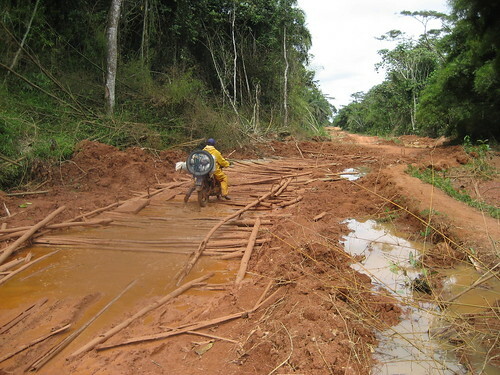 It took Paka 5 days.….and it was not just bad road it was a whole diversity of sorts of bad road. 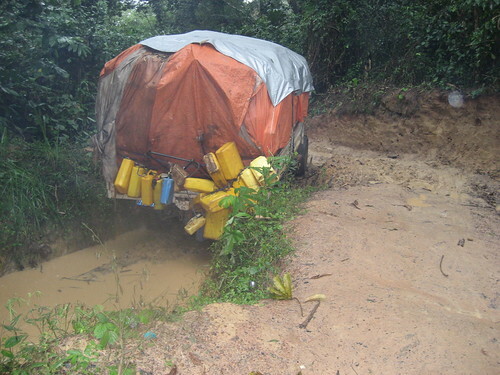 Stuck in the road, a hundred km west of Epulu. This truck is waiting for spare parts, having broken down half way through the worst of it. 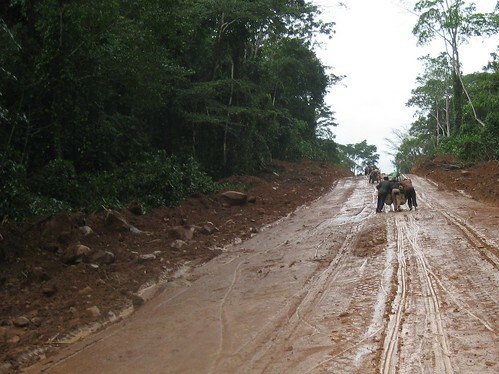 First: the first section of road is under rehabilitation by the Chinese road crew. At this stage of repair, if it starts to rain, it turns into a morass of slippery clay. Hard even to push a bike. The Chinese say that if this was anywhere else in the world, the road would have been done 6 months ago. As it is, in more than a year, they are just past the 2/3 mark (Epulu) of the part they contracted to repair. The worst section of road stills lies ahead of them. 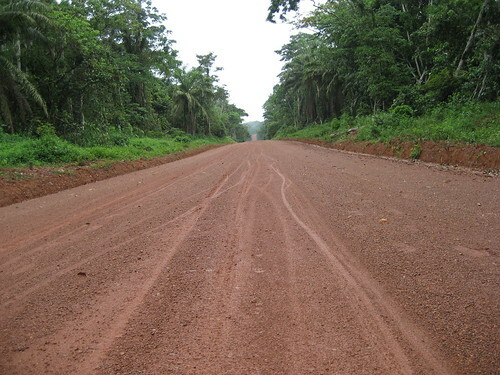 This middle section of road lasts for at least 150 km — without relief. Second : the worst section of road. This middle section is an incredibly rutted and runnelled run-off corridor. It really can no longer be called road. This will keep the Chinese busy for a while. Paka says that the hardest is trying to judge where the water will be shallowest when you walk the bike through the “pits”. Villagers have become used to welcoming the bicycle travelers who end up spending many nights on the road. A mis-step, here in the Lebanese section, and Paka was in over his knees. 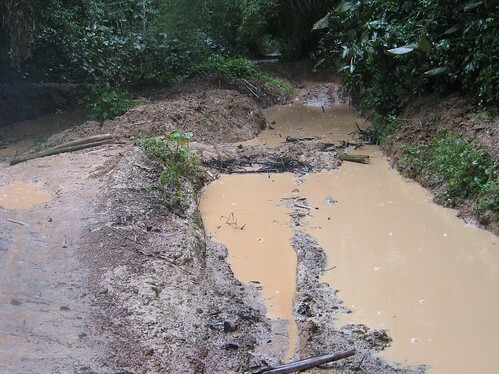 Fourth : the final two lane hard packed finished road — but beware it is already beginning to erode on the slopes ! For the last three days Paka has been riding his bike around the “big city” of Kisangani, picking up culture before heading down the Lomami. The dug-out will be a relief and the Lomami a smooth surface!! Soon, again, down the Lomami. This entry was written by Terese Hart, posted on 2007-10-27 at 6:32 pm, filed under About the project. Bookmark the permalink. Follow any comments here with the RSS feed for this post. Post a comment or leave a trackback: Trackback URL. And we complain about our roads! Every trip must be an expedition. YEP. I did Epulu-Kisangani-Epulu by motorbike earlier this month. Even starting early in the morning and going late into the evening (after 22hrs on two nights!!) it was a two day journey both ways. And as you can imagine the once-active towns in the middle are only hanging on with a bit of artisanal gold and diamond mining. “Wild west” for sure. yes but if we look at immediate contrast: you on your bike are putting in a lot more time and effort than all the motorists around you; whereas Paka had it easy when he compared his light loads to the incredible double-their-weight loads that the average toleka pushes.